Wow, this is easily the worst year I've ever had--besides the first year when I gave up after 10,000 words. I'm currently 8,000 words behind. My NaNo starts are telling me I need to write nearly 3,000 words a day to finish on time. *sigh*. What happened to me this year? I don't know if it's trying to accomplish this with a toddler AND a baby that is erasing my time and energy, but this year has been a huge challenge. I have 5 days left though and I'm not giving up yet. NaNoWriMo is about the perseverance. It's about being able to say: "I accomplished something I didn't think I could". It's about writing every day, about getting into a habit and sticking to it. Most of all, it's about finishing something. So many aspiring authors write and write, dream and dream, but never finish anything. And that's the one thing standing between them and publication. For that reason I love NaNoWriMo because it teaches us to finish what we start, and just get that story out and on paper. So, bring on those final 5 days. I'm going to crush them. Maybe. Well, I will make 50,000 words anyway. I write historical and contemporary romance that is mixed with a little adventure. Stop by and say hey on Facebook, Twitter or Email me at kcsteendam(at)gmail(dot)com. I’d love to hear from you. I touched in this briefly last week, but I didn't realize how much it had really affected me. The Post NaNoWriMo slump. Before NaNo I was writing 1,000-2,000 words every single day, without fail. During NaNo I was writing 1700-3000 words every single day. In the last ten days since the completion of NaNoWriMo I have written a grand total of about 2,000 words. Most days I don't write at all. This has to stop. I tried setting myself a goal, I didn't get anywhere near it. So, how does this change? Well, I know it's not going to change this week and I think that's step 1. Let's be honest. I have a final essay due this week and a final exam to write as well as some moving to do. Basically, until after Novemeber 14th writing is a luxury, not my job. But, after the 14th I will have time and I have to start writing then. Being honest with yourself goes both ways; be honest when you're too busy, but be honest when you really aren't. And that brings me to step 2. Step 2. Get rid of excuses. Okay, so I just listed a few excuses, but they aren't actually because they are things that actually need to get done and cannot fall by the wayside. However, things like that TV show I was watching the other night, those ten blog posts I read during my normal writing time, and the rearranging for the room that I did are completely unnecessary. If you're watching TV with your family, do so with your laptop and write a few hundred words while you're at it (That's usually what I do) otherwise, move on to step 3. Step 3. Schedule writing time. Schedule a time, maybe first thing in the morning while you're enjoying your cup of coffee and write. This might be only a half hour but if you really write and don't think too much about it you can easily get out 500-1,000 words in that time (depending on how fast you type). And if you don't, it'll still be fore than nothing. Remember, this time is not for reading blogs or checking Facebook and Twitter. This time is for writing. Shut down the web browser and dedicate a half hour then you can check all those distractions after. On another note: If you follow me on facebook you probably know that I've received the final artwork for my cover! I've been wracking my brain on how to reveal it to you and I think I have come up with the perfect way. I bought a puzzle of my cover art for my in-laws. It's a tradition of theirs to puzzle during the Christmas holidays so I thought it would be a fun way to reveal my cover to them, and to you. So, every day starting on the 15th (which is also the day I'm announcing the winner of the giftcard raffle. You still have time to enter now if you haven't yet) I will post a picture on my facebook page of a partially made puzzle. Day one with likely just be a pile of pieces and so forth. On the final day (not sure how many days we're going to get out of this yet) I'm going to write a blog post showing each picture, the completed puzzle, and the actual art. Also, I will be running a contest for a coffee mug with the cover art on it and a quote from the book. How is this contest going to run? More details on that in the post on the 15th, so keep your eyes open! #NaNoWriMo is done. The start of a new month. 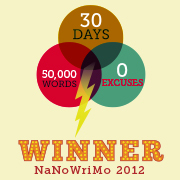 NaNoWriMo is done. It has now been three days since the completion of the writing marathon month and I'm feeling a little ... sad. I loved the rush and pressure as well as the camaraderie that NaNo offered and now it's back to the everyday grind. I'm pleased to say that 3 out of the 4 of us completed the 50,000 word goal. And the 1 that didn't still got a lot accomplished. I'm proud of everyone that crossed the finish line. I'm proud of everyone that crossed the starting line. I'm proud of myself for having the best NaNo to date. I completed the 50,000 word mark on the 18th, my personal goal of 60,000 words on the 25th and finished the entire story on the 30th. Final word count: 68,410. This is night and day difference from my first NaNo, which I gave up on 10,000 words in, and my second NaNo that I completed but struggled to maintain my word count every single day. With Exodus complete it is now time to leave it behind for a little while and return to Unforgiving Plains. Vince and Rayna had been sitting too long and I need to get back to their story. I've taken the last couple days off of writing but with the first full week of December comes a return to work as well. I will return to Exodus for the edits once the first draft of Unforgiving Plains is complete. I'm a little scared though because I already know how much is going to have to change! The editing process always scares me a little but once I get started I love it. There's something incredibly powerful about holding that red pen in my hand and swiping out words wherever I please. Heart Like an Ocean is nearly complete. My Editor and I are on the last few chapters and then it's on to the final read through and formatting. I'm hoping that I'll have some cover art to reveal to you soon and with cover art comes fun stuff. I'm thinking keychains and bookmarks and maybe a coffee mug or two. Also, with the completion of edits means it'll be time to start getting you, my potential readers, excited. Book excerpts and quotes will be coming your way soon. I was planning on starting all that in January but it looks as if I may be starting it this month already. That may mean a little change in the blog schedule as well. With reviews, catch up posts and the addition of Heart Like an Ocean excitement, I think it's time to change to schedule slightly. Catch up posts will continue to come on Monday but I'm thinking that once the edits are complete I'm going to add a Teaser Tuesday segment. As far as the reviews go . . . Are you enjoying them? They are a lot of work but I do want to continue with them. However, I'm considering changing them from Thursdays to Fridays or even one every second week. Of course, it's all flexible. There are some weeks in Decemeber and January that are a complete shuffle of the usual days and also packed very full. December is the end of the year and with it comes a lot of excitement in preparation for 2013. I can't wait for everything it's got in store for me. Thanks for following my journey thus far and I hope you continue to stop by.